As this pavilion will be constructed each summer, we chose to work with elements that could create a different configuration of spaces each time the structure was erected, basing our concept in simplicity and flexibility. We began with a standard sheet of plywood. 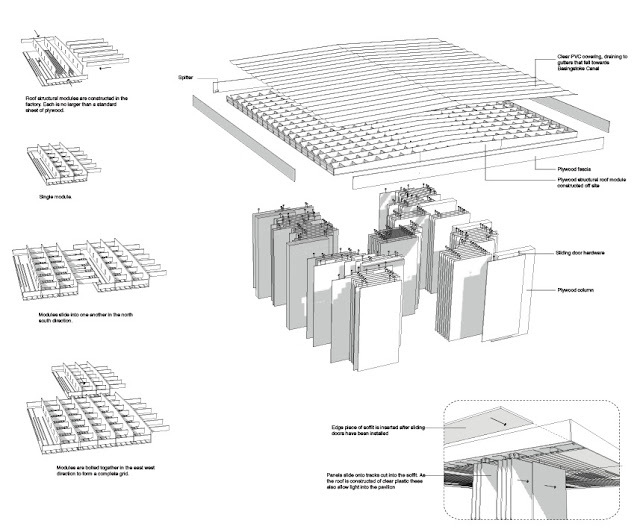 By stacking these and allowing each element to become a sliding panel, an infinite arrangement of spaces to suite various exhibitions and gatherings could be created. The location of the panels not only creates interior spaces, but also reflects the inverse space to the outside, inducing a dialogue with the surroundings and defining outdoor areas. The tracking system allows doors to be moved from the centre to the extremity of the roof space, which permits openings all the way along the pavilion as desired. The interior of the building is not isolated from the elements, although the spacing of the boards ensures that artworks can be locked inside when required. This openness enhances the quality of the pavilion as a contrasting outdoor space in which to view art, from the typology adjacent gallery. Each sliding panel is top hung and has not been fixed to the ground to give the sensation of levitation. Once an exhibition or gathering space has been created, the panels can be locked into position and the pavilion is secured. This concept allows the pavilion to emerge anew each summer, each exhibition and each gathering.